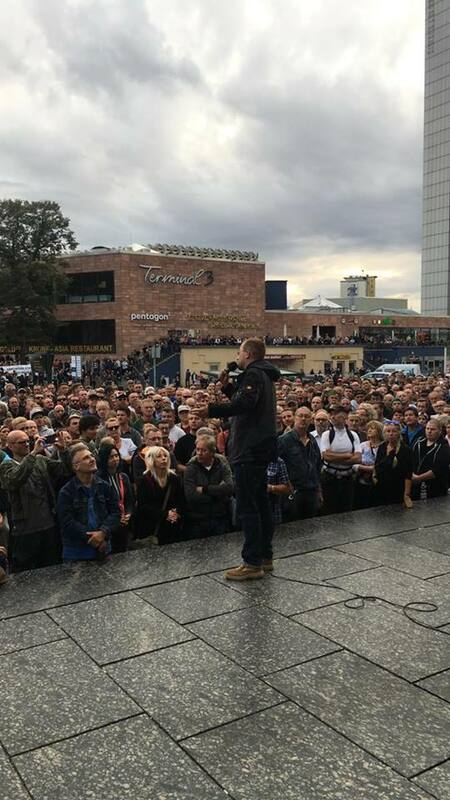 The civic movement “Pro Chemnitz” called for a registered demonstration against migrant crime on Monday, 27 August, at 6 p.m.
A speech at the start of the “Pro Chemnitz” rally. The party “Die Linke” (“The Left Party”) and other leftist groups called for the same time for a counter demonstration against the “Pro Chemnitz” group whom one of the leftist organizations called “Nazis”. While the participants of the two rallies were gathering, disturbances and attacks against the other side started. The Police report about these events doesn’t detail from which side the attacks started but it is quite clear that the leftist demonstrators aggressively tried to disturb the “Pro Chemnitz” rally, for example by blocking the rally’s route. 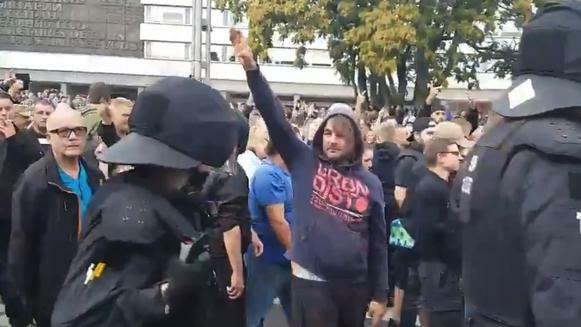 Some far-right people also joined the “Pro Chemnitz” demonstration and the Police reported that some of them showed the Nazi salute, forbidden in Germany. Some people later suspected that some of these “Nazis” might have actually been leftist provocateurs. 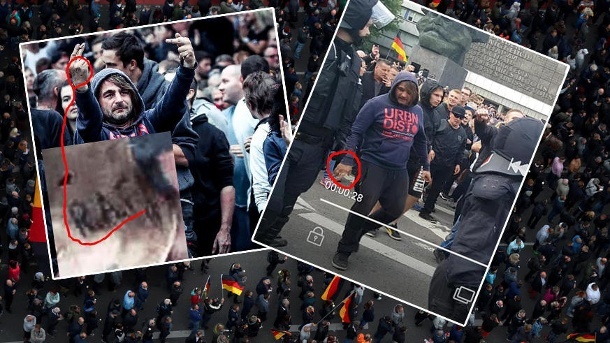 In any case, one of the people whose picture showing the Nazi salute appeared in many media reports as a proof of the far-right leanings of the demonstrators, had a R.A.F. tattoo on the right hand. … and he had a tattoo showing the initials of the leftist terrorist organization R.A.F. (“Rote Armee Fraktion” – “Red Army Fraction”) on his right hand. “R.A.F.” are the initials for “Rote Armee Fraktion” (“Red Army Fraction”), the leftist terrorist organization which committed bank robberies and murders in Germany during the 1970’s. Leftists then alleged that the photo with the tattoo was a fake, but it apparently was not, and at least one German online magazine—T-online—had to apologize for calling it a fake. The “Pro Chemnitz” march started at around 8 p.m. The “Pro Chemnitz” rally en route. The leftist counter-demonstration started at around the same time. 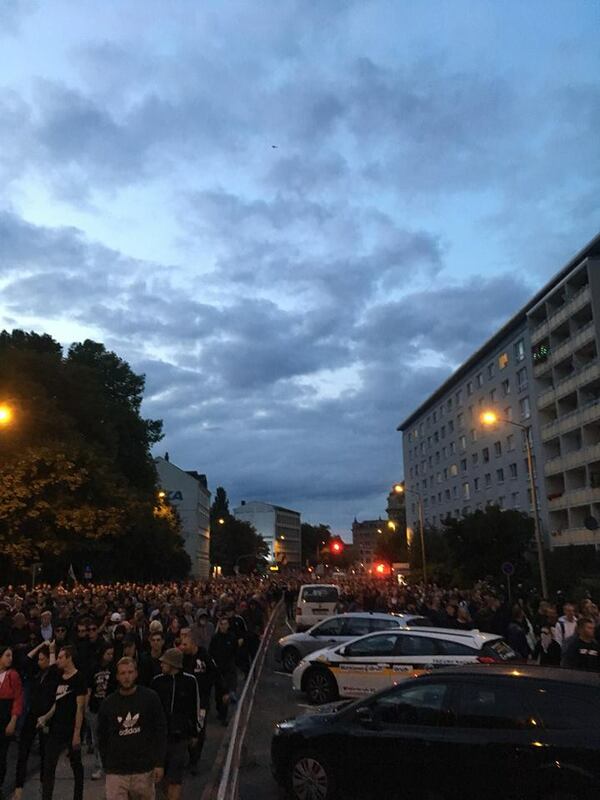 While on the march, the “Pro Chemnitz” rally was apparently attacked with bottles and “pyrotechnics” thrown at them from a house alongside the march’s route. Also, as mentioned earlier, leftists tried to block the route of the rally and had to be removed by the Police. Both demonstrations ended at around 9 p.m. According to the Police report some rally participants were attacked while they were on their way to leave the demonstration. The Police report is vague about who the attackers and the attacked were. But it is pretty clear from the context: masked Antifa, armed with sticks, were the attackers and participants of the “Pro Chemnitz” rally were the victims of the attacks. The Police report states that about 6000 people participated in the “Pro Chemnitz” rally and about 1500 in the leftist counter demonstration. The report mentions that 43 charges were made. It lists, as presumably the most important ones, 11 bodily harm charges, 10 charges for “using symbols of forbidden organizations” (probably Nazi salutes), 3 violations of the Saxony demonstration act and 2 breach of the peace charges. The 10 Nazi-salute charges would have been made against rogue participants of the “Pro Chemnitz” rally. That leaves 33 charges. Knowing the aggressiveness of leftist demonstrators, one would assume that most of the other charges would have been made against them. But even if one assumes a 50-50 distribution of the remaining 33 charges, the Police would have charged 16 or 17 additional “Pro Chemnitz” rally participants with some offense. Man hunts, again: several people were injured in Chemnitz in volent clashes. The police had underestimated the right-wing deployment – and had to allow the mob to do whatever they liked. Reporting about Chemnitz in this style dominated the German media during the following days. The event leading to these demonstrators—the killing of Daniel Hillig—or the serious security problems which Chemnitz had been suffering from since Chancellor Merkel opened the borders completely faded into the background. The problems that almost the whole German media was focusing on was: the “man hunts” by the “right-wing mob” which “ganged up” against foreigners and which showed Nazi salutes. Such ganging up, man hunts of people with different looks, different ethnic origin, or trying to spread hatred on the streets—we don’t accept that. We have video footage that there were man hunts, that there was ganging up, there was hatred on the street. That has nothing to do with our constitutional state. But, as far as I know, the Federal Government does not condemn the almost daily stabbings, rapes and fights by its new charges [i.e. the asylum seekers]. That speaks for itself.